you speak to my romantic autumn side perfectly. and the two of you mingling together on the mantel in the office? Well, that is a perfect pairing in my book. and yes, I was in love pretty much instantly. but wasn't ever really inspired by them. home with me that I think is pretty but wouldn't find the perfect spot to use it in. and, well, they melted my heart. and I used them in a simple quick vignette on the mantel in the office. Mantels tend to make me pause. or have not enough decor to really make it feel decorated. In my opinion, it basically comes down to balance and what you prefer. and is on the smaller side- with a mantel that is only about 8" deep. So it doesn't usually get a huge amount of decoration- just enough. They would also be perfect gathered in a bowl on a table. you can shop the look here for some of them. 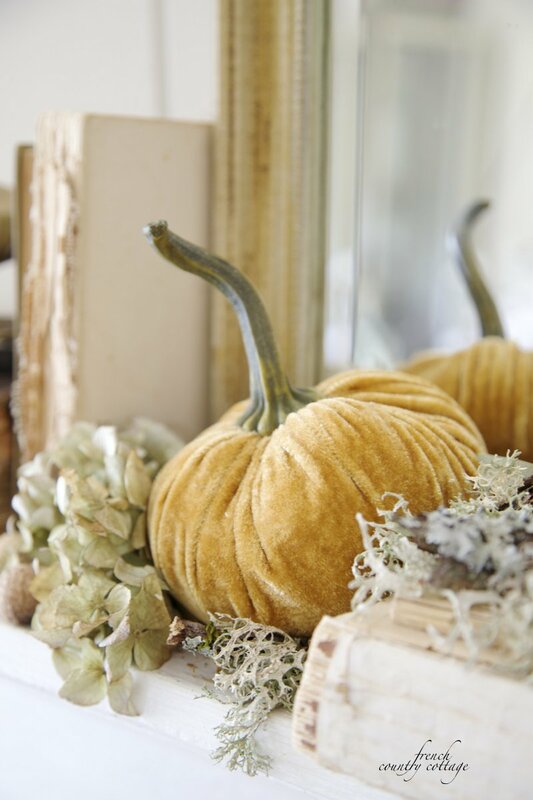 Beautiful fall mantel vignette! I love the colors and your gorgeous mirror! last year they are so romantic. 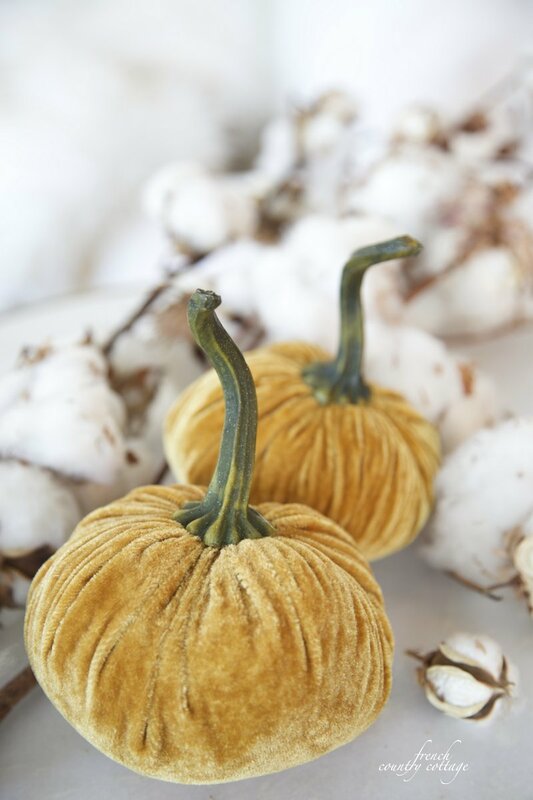 Your petite gokd velvet pumpkins are perfectly loveky in your french cottage. I have two petite grey velvet pumpkins with driftwood stems that were custom made for my sea cottage for about the sane price. I feel the sane way about the mantel. Mine has a scattering of seashells found along the Sonoma Coast. It is just enough to add beauty to the room. I am new to Instagram and enjoy your lovely feed. I love the contrast of the pink and orange. GORGEOUS! 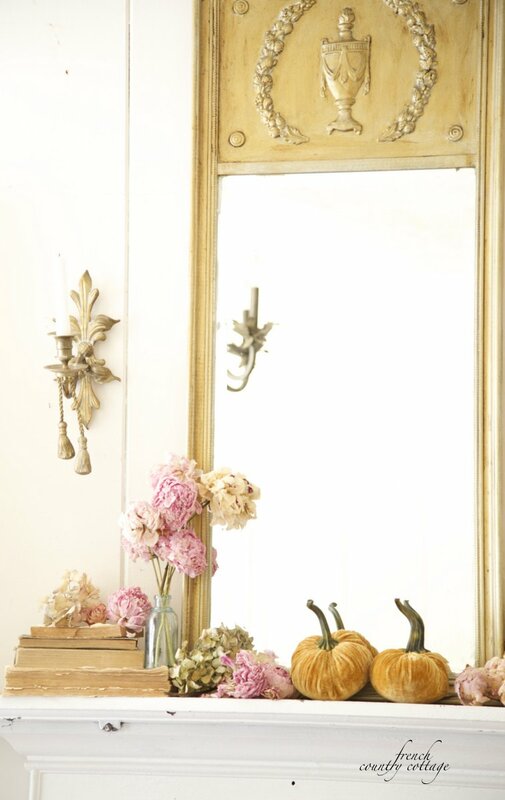 The color of those pumpkins is so buttery and gorgeous! They really echo the tones in your mirror. Beautiful as always, Courtney! These little pumpkins ate drop dead gorgeous. Looks great. So lovely! 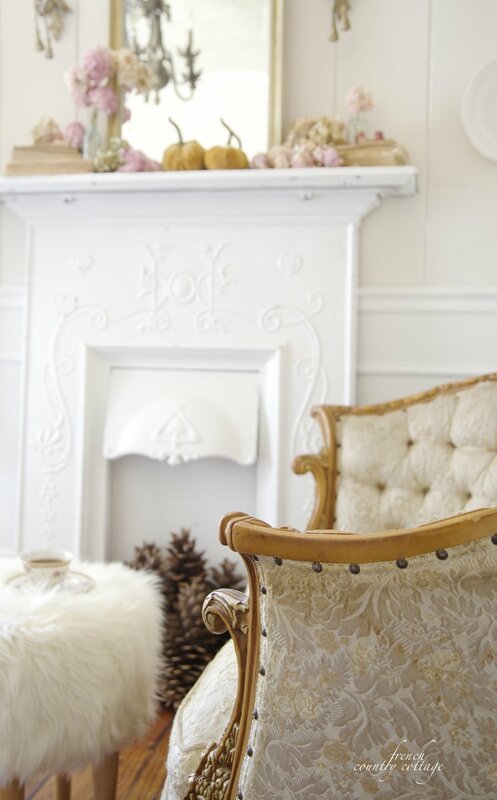 The velvet is gorgeous and they look perfect on the mantel. Wait....where did you get the pumpkins? I must have them!!! I am a librarian and I love your comment that no books were harmed in the making of this vignette!!! I am going to have to remember that one! 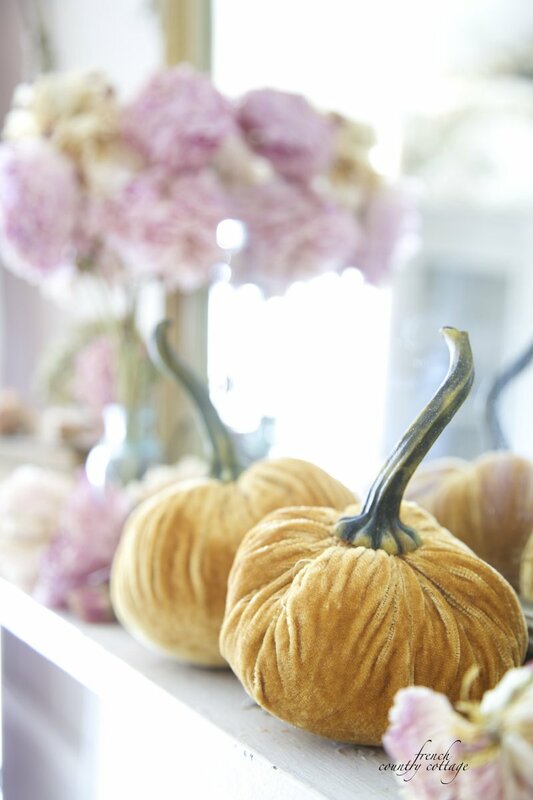 Velvet pumpkins , how nifty & elegant !! I've admired velvet pumpkins for a few years now but haven't bought any. Maybe now is the time:) Love them with the pink contrasting color. 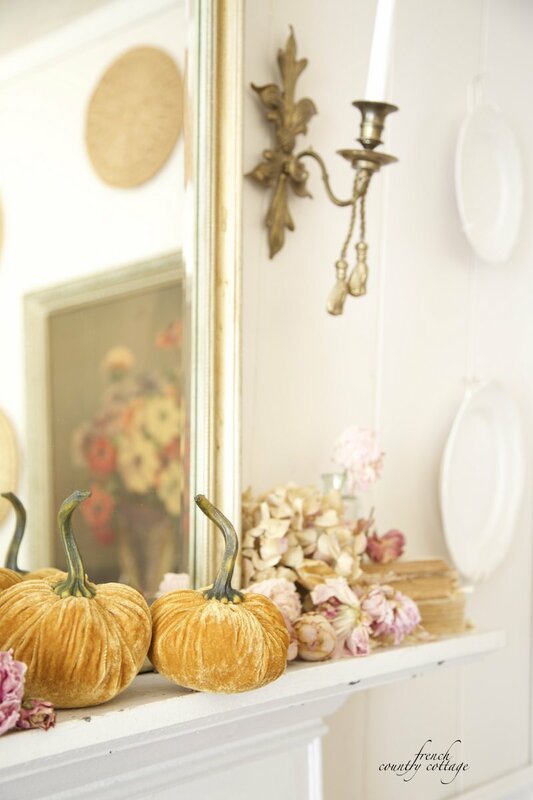 Oh Courtney, if anyone can create a fall mantel vignette with the ever popular Pumpkin color giving it an edge in softness with all it's whiteness surrounding it, it would be you and your beautiful soft French cottage home. I love velvet and this is a way to add a bit of warmth with a big nudge in to fall and all it will inspire. As for that sweet cast iron fire surround, I so wish it were mine, I will have to keep my eyes open for such a find as you have. I love the dried peonies in their pale dried tone of vintage beauty....this whole vignette is like admiring it in a favorite magazine. The mirror and it's patina ties it all together anchoring the beauty you have created. Beauty in all you inspire through fall, yet I am so looking forward to winter here and the amazing romance you add to winter trees of Christmas. Those are so cute -- I love the stems on them. I'll have to check out our TJMaxx. Thank you for the info. You are so right they are perfect. I wasn't quite sure about velvet pumpkins but, i really like yours. Thanks. They are adorable, Courtney. I love the color and the size of these.